Well, I pulled the trigger on this a couple of weeks early :-). We had written a blog a year or so ago on the Road to Emmaus, a portion of Luke 24 that we are reading this week. So we’ll provide some excerpts of that to supplement the remainder of our reading of the chapter. 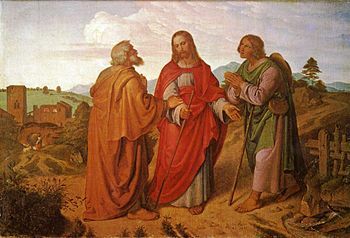 It is still Sunday, the day that Jesus rose; and two of His disciples were traveling to the village of Emmaus. One was named Cleopas, but we do not know the name of the other. We are told in verse 16 that “their eyes were kept from recognizing him” when Jesus drew near. When He asks them about the conversation they are having, the two men proceed to tell him about Jesus of Nazareth. They speak of how great he was, how the chief priests and rulers condemned and crucified him. And now, they say, some women of their company had been to his tomb and found it empty – a fact which others confirmed! They are clearly distressed. Jesus then gave them a mild rebuke for being slow to believe what the prophets had spoken. He then interpreted Scriptures from Moses and the prophets concerning the Christ. As they reached the village, they urged him to stay with them, as the evening would be coming soon. He blessed and broke bread with them, and it was at this point that their eyes were opened and they recognized him. Jesus then vanished from their sight. Such a mysterious and dramatic revelation of Himself to these two disciples would appear to serve one purpose above any other – a proper eyewitness account.